RIO DE JANIERO — Brazilian President-elect Jair Bolsonaro said he expects to visit Israel in March 2019, after accepting an invitation by Prime Minister Benjamin Netanyahu who is currently on a state trip to Brazil, according to a Reuters report cited by the Hebrew-language media. Netanyahu arrived in Brazil on Friday, accompanied by his wife Sarah and son Yair, and the family is set to stay on through Tuesday to join other foreign dignitaries at the inauguration in Brasilia of Bolsonaro, a far-right, security-conscious politician and former army officer elected in October on pledges to crack down on endemic crime and corruption. Netanyahu’s is the first-ever visit by an Israeli prime minister to Brazil. Following a private meeting Friday in a century-old military fort on Rio de Janeiro’s Copacabana beach, the two issued the warm words to the media, hailing a nascent “brotherhood” between their countries that will boost economic, military, and technological cooperation. They then visited a local synagogue. Bolsonaro, sometimes called the “Trump of the tropics” for a similar style to US President Donald Trump and rejection of multilateral diplomacy, emphasized the bond he wants to build with Netanyahu, a firm US ally. “More than partners, we will be brothers in the future, in economy, technology, all that can bring benefit to our two countries,” Bolsonaro said. He also spoke of cooperation in military and agriculture matters. “Through our mutual cooperation, enormous benefits will be created for our two peoples,” Netanyahu said. “It’s hard to believe that we had no such contacts before,” he added. 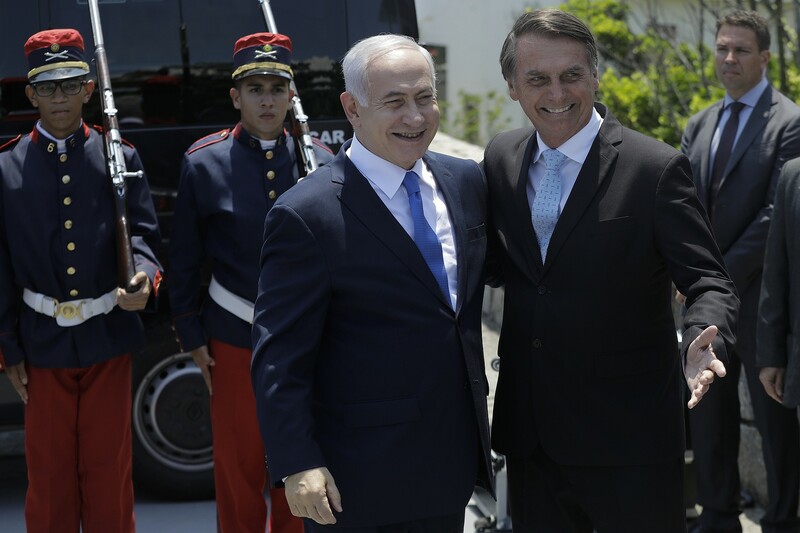 Netanyahu announced his trip to Brazil following a November 1 tweet from Bolsonaro indicating he intends to move the Brazilian Embassy in Israel from Tel Aviv to Jerusalem, following in Trump’s footsteps. He later walked it back. There was no mention of Bolsonaro’s post-election declaration on Friday. Netanyahu had told reporters on his flight to Brazil that “you can be certain I will speak with him about that in our first meeting.” But neither man raised the topic in their comments to media, and no questions were taken. An embassy move could put at risk lucrative Brazilian poultry and halal meat exports to Arab countries, which fiercely oppose any unilateral moves seen as cementing Israel’s claim to all of Jerusalem as its capital. The Palestinians view East Jerusalem as the capital of their future state, and most countries in the world back a longstanding consensus that Jerusalem’s status can only be resolved through negotiations and as part of an Israeli-Palestinian peace process. Nearly 20 percent of Brazil’s $5 billion beef exports go to 17 Arab countries. Brazil-Israel trade currently amounts to $1.2 billion. Bolsonaro’s ascent to the presidency represents a dramatic, rightward shift in Brazil’s politics. For decades, the country has been under center-left and center-right rule and resolutely sought to carve out foreign policy independent of the United States. In 2010 the country recognized a Palestinian state, and it nurtured trade and investment relations with China. But Bolsonaro has spoken with hostility of China’s investments in Brazil, and he and one of his politician sons have reached out to Trump and people in his orbit. He and his team have also excluded the far-left leaders of Cuba, Venezuela, and Nicaragua from attending the inauguration in Brasilia, although Bolivia’s left-wing President Evo Morales received an invitation. Other VIPs attending include conservative Chilean President Sebastian Pinera, Hungary’s far-right Prime Minister Viktor Orban, and US Secretary of State Mike Pompeo. Netanyahu made his Brazil trip despite domestic political turmoil in Israel and a spike in military volatility in neighboring Syria. Pompeo and Netanyahu are to discuss Syria on the sidelines of Bolsonaro’s swearing-in, an Israeli official and the US State Department said. US allies including Israel were caught by surprise by Trump’s abrupt announcement last week that he was pulling US troops out of Syria, where Israel’s arch-foe Iran has built up a significant military and political presence. Israel has made several aerial strikes in Syria against positions held by Iran and its Lebanese militia Hezbollah. This entry was posted on December 29, 2018 at 12:12 PM and is filed under Uncategorized. You can subscribe via RSS 2.0 feed to this post's comments. You can skip to the end and leave a response. Pinging is currently not allowed.